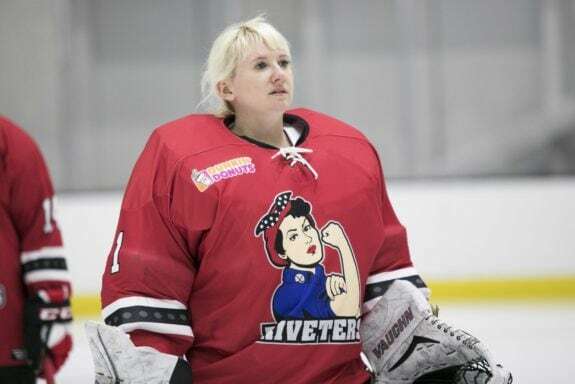 After taking a year off to focus on her career off the ice goaltender Kimberly Sass is back in the NWHL, this time with the Metropolitan Riveters – after suiting up in the first season of the league with the Buffalo Beauts. It can be tough not playing regularly and being part of a team in a support role, but that hasn’t dampened any of the emotion and energy of Sass who is currently the backup to Katie Fitzgerald on the Rivs. 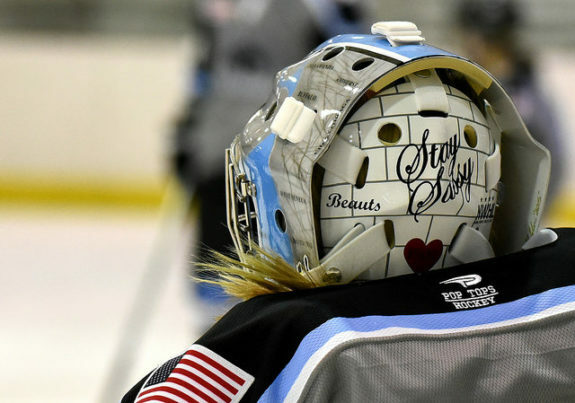 The 27-year-old netminder is from East Amherst, New York so the connection with the Beauts made sense at the time, but it was her career path off the ice that has enabled her to play for the Riveters in Newark, New Jersey while pursuing a second passion across the river in New York City. The Hockey Writers spoke with Sass following a recent practice to get some insight on her return to the league, how she became a goalie, and why her two careers are so intertwined, among other topics. The Hockey Writers: So what led to your decision to come back to the NWHL after a season away? 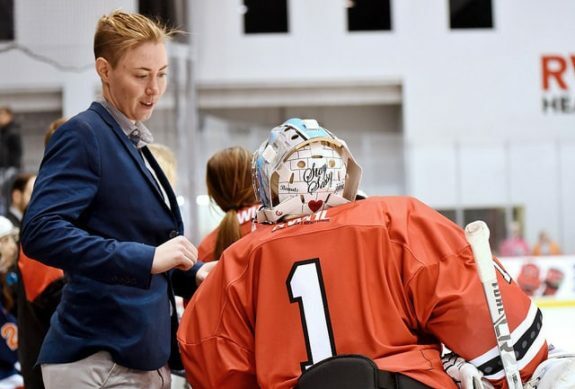 Kimberly Sass: I had reached out to (Riveters’ head coach) Chad (Wiseman) before season two actually and they already had their goalies signed, so I decided to use that as an opportunity to focus on my career; I was open to the idea of playing in the third season if anything opened up. Chad contacted me about this year and I said ‘Absolutely’ (chuckles). I love the city and I had previously interned here at an architecture firm, so things just kind of aligned in terms of my career and I was able to make the move from Buffalo to play. Fitzy has been playing phenomenal, and coming in I knew she had earned her position, her role on this team. She started in a backup position last year and made her way (to this point) to start every game. I have incredible respect for Katie Fitzgerald, she’s awesome. THW: Was it tough watching your former team win the Isobel Cup last season or were you just happy for former teammates? KS: I played with a bunch of the returning second-year players on the Beauts and I was happy to see them get that win. But there was also a feeling of missing the game, missing playing, missing practicing; definitely mixed emotions with that. THW: Why did you decide to become a goalie? KS: I was seven-years-old when my parents got my sister and I involved in figure skating. The coach of the only girl’s team in the area, they played against boys at the time, approached my dad, sister, and I and asked if we wanted to join the girl’s hockey team. I was never an amazing figure skater, and my dad played goalie so it was definitely a no-brainer for us. I started playing as a skater and quickly migrated to the net (laughs), from then on my dad was my goalie coach until I signed to play at Colgate University. I also played for my high school boys JV and Varsity teams. I played there (at Colgate) for four years, graduated and at the time the only option to compete at a high level (if you weren’t on a National Team) was going to Europe to keep playing. I felt like that wasn’t really for me at the time, I was figuring out my career. I majored in Studio Art and Geography. I had taken one architecture class and made the decision to go towards that, and the program was a three-and-a-half-years so I didn’t want to delay that any longer than I had to. I went straight into architecture and about my third year in I heard about the NWHL. I told myself ‘I need to go for this’ (smiles). It’s so hard graduating and having hockey come to an abrupt end. No one talks to you during your senior year about how difficult it is mentally, about ending your career; something you’ve been doing for so long in your life. This league is an amazing opportunity that (I’m glad) I heard about and am grateful to be a part of. THW: Being a goalie and being an architect – which is also heavily reliant upon angles – does that help you out? KS: Art and architecture are very detail-oriented, and I think my personality is the same. I think that helps me out in terms of the geometry, the angles, challenging shooters, cutting down the angles. THW: You mentioned your time at Colgate, where you knew one of your current teammates, right? That has to help when coming to a new group. KS: I was a freshman when Kiira Dosdall was a senior at Colgate. Women’s hockey is a small world; I knew Tatiana and Brownie from playing with the Beauts. I knew Erika Lawler and Rebecca Morse from coaching, so I actually knew more people on this team than I did in Buffalo. 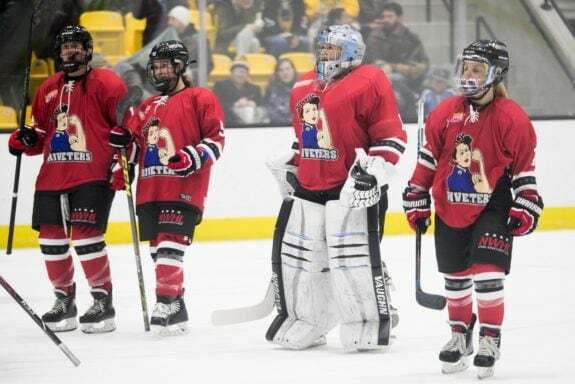 THW: What have the past four months been like with the Riveters? You haven’t played in a game, but the team is undefeated and you’re showing up and working hard in practices. KS: I’m glad I came back, it has been nothing short of amazing. Moving into the city, the fans are unbelievable – the postgame autograph line is so long every single home game; they give us presents waiting for us in our locker room. Like I said before I knew coming in that Fitzy had earned and worked so hard for her no. 1 position, so Sarah (Bryant) and I both come to practice, work hard, and know that we need to be ready in case anything happens. That’s our job. The coaching staff runs highly competitive practices with game situation drills, which I think we all appreciate. THW: You mentioned the fans, tell us about what they are doing to help you get a new mask. That has to be such an awesome feeling to see fans doing that, and buying merchandise with your name on it, right? KS: The helmet (smiles). It is amazing. Fans will message us, we as players have talked about this – oh my goodness so-and-so just tweeted out a picture of them, they bought my jersey. That’s just…something that players weren’t used to in college and that’s an amazing feeling. Myself with an art background, I’ve enjoyed seeing how creative people get! I thought it was so clever – the first game we were signing autographs and someone made a Rosie pin. I said: what’s this? She pointed to the logo and it’s the pin that Rosie is wearing in the Riveters logo. Attention to detail (smiles), I like that. THW: How stoked are you to design a new mask, as an artistic person? You probably enjoy designing your pads, mask, etc. even more than your average goalie, right? KS: Having two passions collide is always an incredible feeling. I’ve designed every single mask I’ve had a paint job for and it’s one of my favorite things about equipment (grins). You are able to create a sense of identity and uniqueness, which skaters are not able to do. I will make sure to include some strategic things about my experience with the fans in the new helmet design. I’m hoping to do a fan vote, maybe have a couple of options so they can get involved and see which one they prefer. I’ve started to think about it! We will see how the fundraiser goes. THW: Most goalies would admit that they are weird or different, would you agree with that assessment? KS: Y-y-yes. Yes and no. I’ve been told that I’m on the normal side when it comes to weird goaltenders. Other people might argue because I’m an artist that I’m just automatically deemed weird (grins).